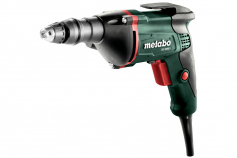 The Metabo drywall screwdrivers quickly and powerfully join gypsum plasterboards and gypsum fibreboards on substructures made of wood and metal. The six different models also include three cordless drywall screwdrivers that are operated with an 18 volt battery pack. A mains-powered screwdriver and a cordless screwdriver each are designed for a main application area with a particular ratio of speed and torque. The cordless screwdriver SE 18 LTX 2500 and the related mains-powered screwdriver SE 2500, for example, have a high torque and can handle gypsum plasterboards and gypsum fibreboards on wood or metal substructures very well. 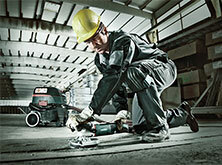 The cordless SE 18 LTX 6000 and the SE 6000 with cable are the fast ones with high speed for quick work progress. They are ideal when it mainly comes to gypsum plasterbords on metal u-profiles. The screwdriver models SE 400 and SE 18 LTX 4000 for universal use have a balanced combination of power and speed and are also suited to fix gypsum plasterboards on metal constructions. 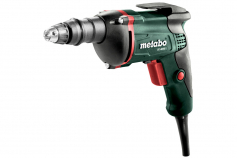 The drywall screwdrivers from Metabo are useful helpers in interior development when many light gypsum plasterboards or gypsum fibre boards are processed. Thanks to the compact design and their low weight, the special screwdrivers are ideally suited for comfortable one-hand operation. They all have a bit retainer with a 1/4" hexagon recess and are equipped with a magnetic bit holder. The low-noise claw clutch and the very finely adjustable depth guide permit precise and quick working. The depth guide can be removed completely when working "at sight level". The speed can be infinitely adjusted for material-compatible working. The integrated work light for dark corners and a practical belt hook are other sophisticated details for comfortable working in interior development. All drywall screwdrivers can be equipped with the screwdriver magazine SM 5-55. Standard 50-screw strips in common dimensions can be used. 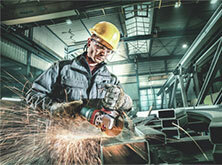 Fast and precise screwdriving in series is very well possible with this robuts magazine attachment. Using such a cordless magazine screwdriver, the gypsum boards are screwed together even faster. The magazine can simply be removed for individual screws.